Life, Doctor Who & Combom: BBC Release Official Synopsis of "The Day of the Doctor"
BBC Release Official Synopsis of "The Day of the Doctor"
The BBC Media Centre has released the official synopsis of the 50th special, The Day of the Doctor. Given what we know about the special (e.g. the leaked synopsis and the Dalek images), we could presume the "ancient battle" is the end of the Time War on Gallifrey and the "murderous plot" part could simply be the Zygons and the Tenth Doctor. You can also see pictures and videos from the filming outside of the National Gallery here and here. The exact time of the special is still to be confirmed. 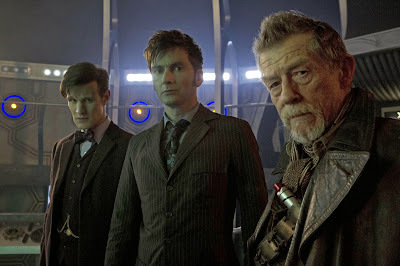 Did Matt smith mention "paintings" months ago when asked about the other doctors appearing? The Doctor has always said he ended the time war... I wonder which dark soul started it?